Lastly , let’s look at a reel in A minor ( or A Dorian mode to be precise) – Brenda Stubbert’s. I have chosen this tune because it is a popular session tune, and also because it contains some ornamentation challenges different to most reels. This is because it contains no rolls, but there is a lot of cutting of crotchet-length notes. In this regard it has more of a Scottish feel to it, probably because it comes from Cape Breton In Canada, whose music tradition mixes both Irish and Scots inflections. 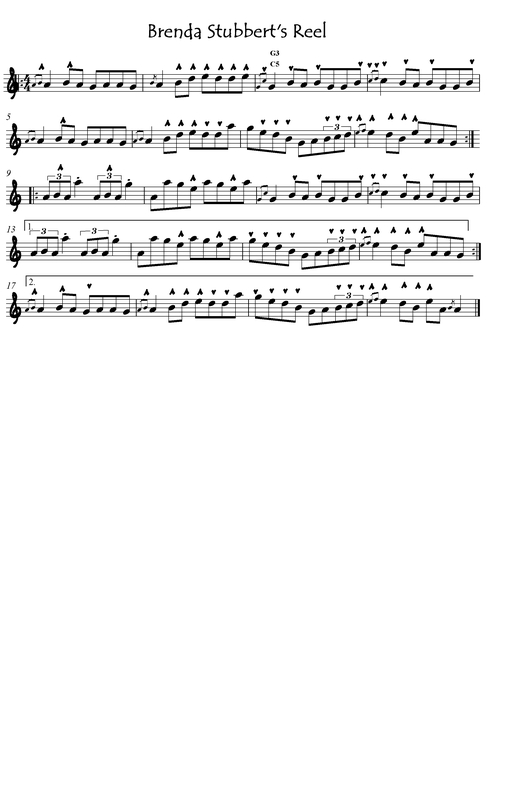 It is a modern tune, written by a famous Cape Breton fiddler called Jerry Holland. As an overall gloss to the score, the up and down arrows are mostly not prescriptive. It might suit you better to play those notes in the mid-range which you can play either on the draw or the press ( B to e), in the opposite direction. As an example, the sequence of 6 quavers n bar 2 – Bd edde – will work just as well all on the press if you’re more rhythmic and comfortable with that. The cutting of A in bars 1-2, 5-6 and 17-18 is with the drawn B on the right hand side ( button C6 ) and I find that gracing with a note on the opposite side of the instrument to the graced note gives me better balance and timing. Of course you don’t always have an option with the opposite hand, but in this tune you do throughout. Note that I give 2 different versions of this cut. The first one, in bar 1, has 2 gracing notes – the A and the B. The second has only the B. The longer one has more of a gurgle to it, which suits the concertina, and the shorter is more of a true cut. But try both and see which suits your playing better. The first G in bars 3 and 11 is graced with the pressed c on the opposite side, also at button C6 as it turns out. Another way to accent this note is not to grace it at all but to double it i.e. play both G3 and C5, as indicated in bar 3. This gives a louder, accordion-like effect, which also serves to highlight that note. In bars 4 and 12 the c is graced with the pressed d at button G5, again with the opposite hand. The e in bars 8,16 and 20 is graced with the next note up, the f# , again played on the opposite side. . This I really a fiddle tune par excellence and these notes are simply played as an A triplet on fiddle, which is easy. On the concer not so easy. You could simply play the note A 3 times in rapid succession but I find that sounds clumsy. The triplet A-B-A is a much better compromise. But the first 2 notes are played very quickly, and the 3rd note A is longer, so that you get more of a stuttering effect than hearing 3 separate notes, and so the middle note is not really discernible as a B. Having said all that, you should really listen first to a recording of Brenda Stubbert’s before trying this ornamentation. It has a very special feel to it and is not the sort of tune you can easily learn off the page. find this tppic to be really somnething thqt I feel I might by no means understand.